Summer is a time for visiting beaches and sunning yourself, but July provides the opportunity to remind us of the dangers of Ultra Violet (UV) rays as we promote UV Safety Month. There is clear and compelling scientific evidence linking tanning devices with increased incidence of skin cancer, including melanoma, basal cell cancer, and squamous cell cancer. UV radiation from tanning devices has been classified as carcinogenic to humans by the World Health Organization’s International Agency for Research on Cancer. 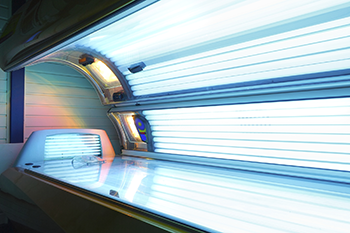 However, the popularity of indoor tanning has grown, especially among teenage girls and young women. By the age of 17, more than 35 percent of white females use tanning beds. Of those, 62 percent use them at least ten times per year. A review of seven studies discovered a 75 percent increase in risk for melanoma in those exposed to UV radiation from indoor tanning before age 35, with the risk increasing with each use. Adolescents and young adults are at even higher risk for melanoma and other forms of skin cancer with tanning device use. Several countries, including Australia and Brazil, prohibit indoor tanning and numerous states in the U.S. have passed restrictive legislation and thirteen states prohibit indoor tanning for people under age 18. Considering the rising incidence of skin cancer in the U.S. and the dangers associated with tanning devices, AACI, along with the Alliance of Dedicated Cancer Centers, the American Association for Cancer Research, and many other organizations in the cancer community, came out in support of a joint position statement on indoor tanning. AACI is proud to support efforts spearheaded by Alan Geller, MPH, RN, Harvard School of Public Health, and Jeff Gershenwald, MD, University of Texas MD Anderson Cancer Center, who educated policymakers about the importance of prohibiting the use of indoor tanning by minors, promoting educational efforts to effectively communicate the risks of indoor tanning to teens and their parents, and recommending that states counter-advertise to debunk the perceived ‘beauty’ of tanned skin. Last week, Rep. Rosa DeLauro (D-CT) called on the FDA to issue a nationwide ban on indoor tanning for minors. Her call to action was just the beginning of efforts to curb the use of tanning beds across the country. UV Safety Month is a great opportunity to advocate for the ban of indoor tanning and promote UV safety. Today, by a vote of 344-77, the House passed H.R. 6, the 21st Century Cures Act, a bill championed by the cancer community and the biomedical research community at large. Yet, this victory was not achieved without challenges. This week, the House Rules Committee approved an amendment offered by freshman Representative Dave Brat (R-VA) to make the National Institutes of Health (NIH) Innovation Fund and Cures Innovation Fund in the bill discretionary funds, rather than mandatory. The amendment threatened to derail the bill and the advocacy community fought back. The Brat amendment failed by a vote of 141-281. The bipartisan legislation, introduced by Representatives Fred Upton (R-MI) and Diana DeGette (D-CO), which passed the House Energy and Commerce Committee unanimously in May, garnered 230 cosponsors and gained the support of 76 AACI cancer centers. H.R. 6 creates innovation funds for the NIH and FDA that would not be available through regular budgetary procedures over the next several years. The bill prescribes mandatory funding in the amount of $8.75 billion for the NIH and $550 million for the FDA over the next five years. The final roll call vote can be found at http://clerk.house.gov/evs/2015/roll433.xml. Please thank your legislators for supporting the bill.